Announcement Unique art prints are instant easy home decor, just print, frame and hang! Printable Downloadable Art Prints of handmade fiber art and quilt art, plus my own personal planner printables which I use in planning, organizing and executing my artwork. 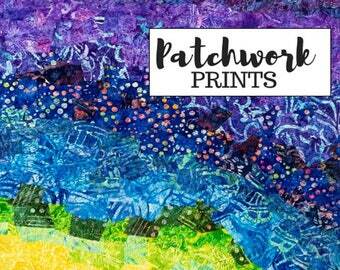 Welcome to Patchwork Prints! I make unique wall art using fabric and fibers, and then use these quilter fiber art pieces to create downloadable printable art prints. Each original art piece is one of a kind and made by hand. Prints are a low cost way to bring custom quilt art into your home. These art prints can also be used in other projects such as scrapbooks, cards, bible journaling, church bulletins and more! Unique art prints are instant easy home decor, just print, frame and hang! Printed out perfectly. I love rainbows and this one is extra special because of the intricate design. I can’t imagine the work involved to create the original fiber art piece this was printed from! Beautiful and truly unique. Displaying one of my favorite art quilt prints in my home! Work in Progress: Pulling fabrics and creating a wall quilt of lily pads on water. Work in Progress: Planning a grayscale landscape quilt, using my Project Management Planner printable pack. Affordable art to decorate your home and fill your gallery wall! INSTANT ART ready to download. Just print, frame and hang! I am a mom, wife and avid quilter. My day job is writing about technology topics for software companies plus managing our home and family. By night, I work with fabric and thread in my "mom cave" creating quilts and quilt art.